Surrendering your dog is a difficult decision – we are here to help. A volunteer will contact you as soon as possible. Consider gathering available vet records to help us determine any health needs for your pet. Learn more about the surrender process below. How soon do you need to surrender? We do not have a kennel facility; our foster dogs live in approved homes. We cannot pay for surrendered dogs, but we can provide healthcare that is needed. We have a large network of Golden Retriever lovers and over 25 years of experience helping this beautiful breed – please feel free to call our Goldline! Most dogs that come into GRRIN’s care are surrendered voluntarily by their owners due to allergies, divorce, relocation or some other change in family status. In other cases, owners realize they lack the time or resources to give their Golden Retriever the attention, care and exercise they need to be happy. Please note that we may be unable to take dogs with behavior issues that we believe will make them unsafe to place with a foster volunteer or adopter. Whatever the reason for surrender, GRRIN begins the process of bringing a dog into our program by completing a telephone interview. We then have a volunteer meet and assess the dog to evaluate their adoptability, which includes overall physical condition, temperament and behavior. Dogs accepted by GRRIN should be recognizable as Golden Retrievers, including dogs that have been abandoned or found as strays. 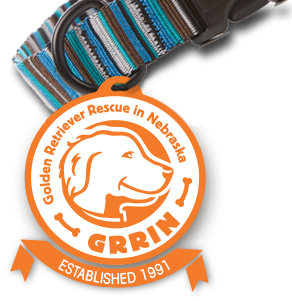 Surrendering owners will be required to sign a GRRIN transfer of ownership form when their dog is accepted into the GRRIN program. They will also be asked to prepare the dog to enter rescue by updating needed veterinary care. 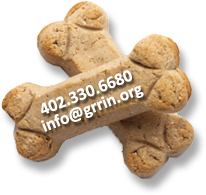 If owners are unable or unwilling to complete the dog’s medical needs, a donation will be requested to help GRRIN pay for veterinary care. All Golden Retrievers in the GRRIN program will be spayed or neutered, brought current on vaccinations, tested for heartworms and intestinal parasites, and receive all other needed medical treatment prior to adoption. GRRIN will not disclose the identities of the surrendering owner or the adopter to one another. All pertinent information regarding a dog’s physical condition, temperament and behavior will be shared with prospective adopters by the dog’s caseworker and foster family. Prospective adopters are thoroughly screened by GRRIN via phone interview and an in-depth home visit. GRRIN’s ultimate goal is to make the perfect match for the Golden and the family; therefore, much attention is given to understanding the needs of both.